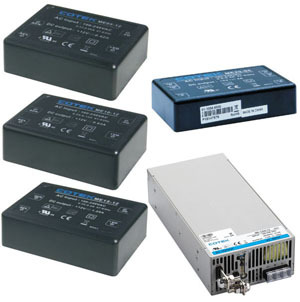 Cotek Series ME medical power supplies feature class II isolation level. These power supplies can be installed into patient contact medical equipment and still comply with Class B per EMI regulations. Standard functions include short circuit, overload, overvoltage and overtemperature protections. General medical or industrial usage that requires low leakage current, general electronic applications, and low profile IT equipment are all suitable for integrating these on-board type PSU onto the main control PCB of the final system. Models from 5W to 20W feature a green design, with no-load power consumption < 0.3W, Isolation Class II, and high operation temperature, up to 70°C. Protections include short circuit, overvoltage, overload and brown-out (low AC input voltage). Models from 5W to 15W feature a fully isolated plastic case, and employ free air convection cooling. Both output voltage and current of the 1200W models are fully programmable from 0 to 105%. The 1200W models also feature constant current limit, Selectable +5V/0.5A or +8V/0.3A auxiliary output, global control via RS232, forced current sharing for parallel operation, remote access via RS232, 485 & I2C, Power OK signal, remote ON/OFF, and remote sense. Protections include overvoltage, overload, overtemperature and fan failure.